When there's no linguine around, I just simply used spaghetti. And I also like to replace the salt-pepper with some peperoncino herb, so I get the salty taste from the parmesan cheese. 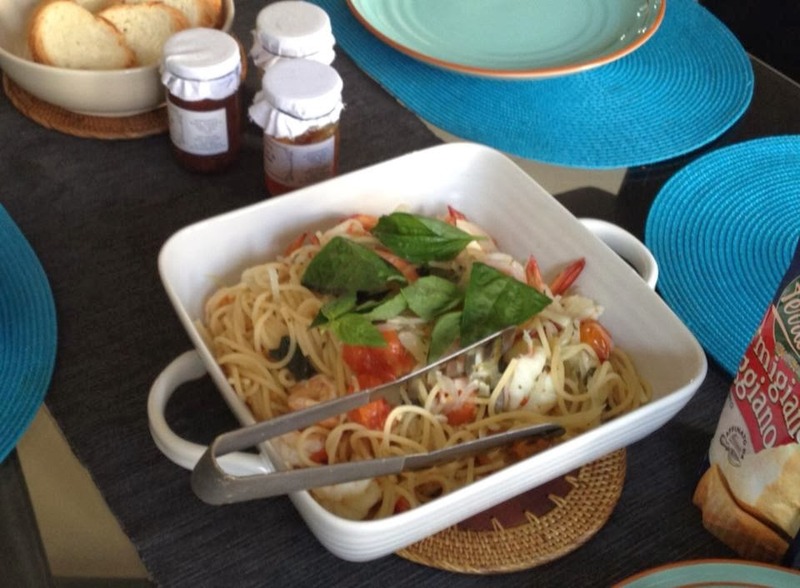 That weekend, after I made one pan pasta for breakfast (yes, for breakfast! ), I really in the mood for cooking, so I decided to try another recipe, Patty Burger from Annabel Karmell (I copy and post it below). It wasn't exactly Goods Diner's Coffee Rub Burger, but the result was pretty good. 1. Peel and chop the onion into small pieces. Heat the oil and gently cook the onion for 8 minutes or until it's soft. Stir in the sugar and balsamic vinegar. 2. Turn up the heat and cook, stirring, for 2 minutes until onion caramelizes (the sugar on it turns light brown). Stir in the thyme. Then transfer the mixture to a bowl and leave to cool. 3. Add the beef, breadcrumbs, egg yolk, milk, soy sauce, salt and pepper, mix everything together lightly so the burgers stay soft and moist when they cook. 4. Divide the beef mixture into four servings. Roll each one into a ball, then flatten slightly into a burger shape. Cover and chill in the fridge. 5. Oil a frying pan lightly, and cook the burgers over a low heat for 4 to 5 minutes each side.